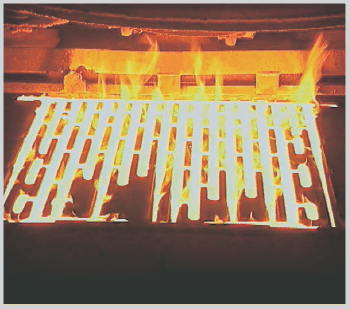 Developed in Germany nearly 60 years ago, Schonlau cast iron farrowing slats are second to none and have been proven to outperform any other sow flooring on the market - their strength, performance, and durability are unsurpassed. No other cast iron on the market achieves the physical characteristics, quality, and durability of the patented Schonlau cast iron floor. 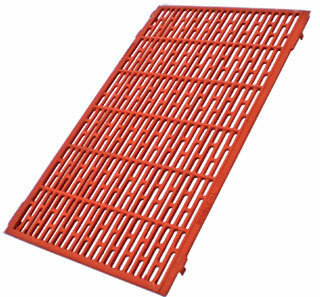 The cooler cast iron surface is preferred by the sows and keeps them more content. When producers increase sow's comfort, it facilitates more feed intake which results in heavier weaning weights, which in turn leads to a better return on investment. Using a unique manufacturing process, Schonlau cast iron provides superior manure filtration simply by the sow's natural movement. 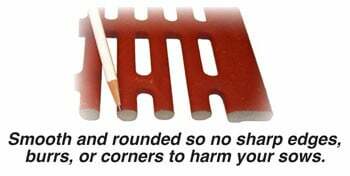 The long 3/8" wide slots are positioned so the slats clean easily and stay clean. Schonlau cast iron sow flooring features high / low traction bars that are all the same thickness for added strength. Schonlau cast iron is made from an open mold process which results in a crowning effect, giving the herd the ultimate in traction and comfort. The crowned surface of the Schonlau cast iron allows your sows to get up and down easily and maintain more control. A sow that physically has more control will lay on fewer pigs; will eat, drink and nurse better; and with less stress, will produce heavier pigs at weaning time. 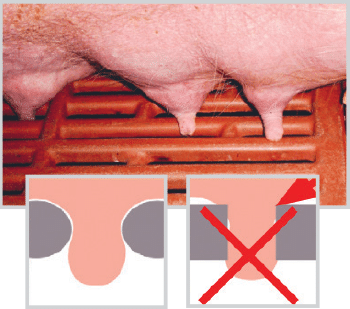 With its rounded corners and smooth surface, Schonlau cast iron allows manure to filter readily to maintain a clean, healthy environment for your pigs. Nonporous, crowned surface is easy to clean - it is smooth and rounded so no sharp edges, burrs, or corners that can harm your sows. Schonlau and the competition's cast iron flooring are made of very different material and molding. Schonlau cast iron flooring has rounded shaped bars without a sharp finish that are actually better for your pigs. Only Schonlau's slats are manufactured in the "open mold process" - thus only Schonlau slats have eliminated sharp edges and part lines. Independent German Institutes confirm there is 6% less teat injuries with Schonlau Cast Iron compared to the competition. Fewer injuries will result in greater production and higher profits. This is why European's biggest companies use Schonlau. Sows are a costly economical factor, now more than ever. You must enhance a pigs early performance with intact teats since a lost teat is a lost feed bar. Producers must justify any teat injuries due to increasing fertility of sows and increasing pig numbers. No sow teat squeezing compared to rectangular 90 degree bars. Schonlau cast iron has rounded corners and a smooth surface that allows manure to filter readily. Non-porous, crowned surface is easy to clean - no flashing! A farrowing floor that performs well helps improve the sow's potential and maximizes profits. Schonlau cast iron is made from an open mold process which results in a crowning effect, giving your swine herd the ultimate in traction and comfort. Protect your investment with Double L's combination flooring system - Schonlau cast iron under the sow and Maxima polypropylene slats in the creep area. Schonlau cast iron sow flooring is "cool" for the sows and uncomfortable for the little pigs so they are inclined to stay off the cast and are less likely to get crushed. 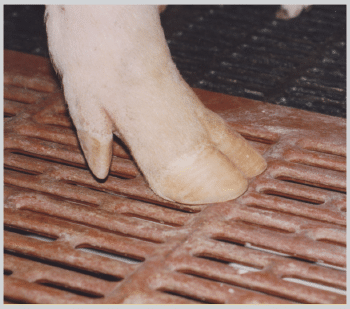 Producers reported they save at least one pig per litter from a crush death with combination cast / creep floors, making it a very cost effective option. 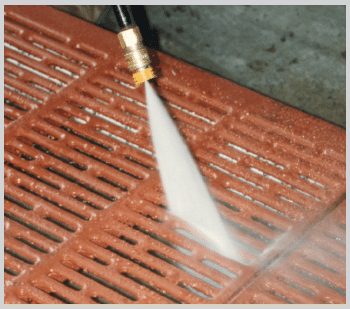 The PS57 Schonlau / Filter-Eeze polypropylene creep combination flooring system is superior since the cooler cast iron surface is preferred by sows and the warmer plastic Filter-Eeze polypropylene creep flooring is "warm" and preferred by the little pig. Since pigs tend to spend most of their time on the warmer surface, there are fewer crushing deaths. Filter-Eeze® does not rob little pigs of body heat; thus, little pigs experience less chilling and fewer diseases. Available in 7 foot, 7 1/2 foot, and 8 foot lengths.